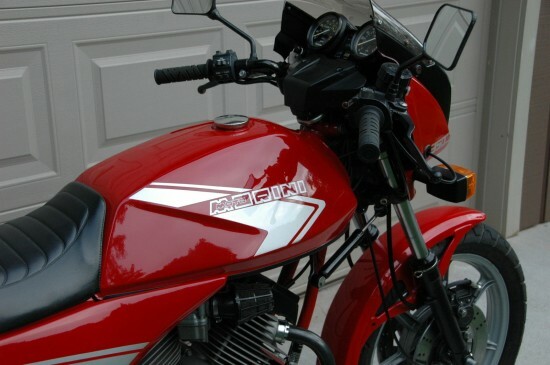 If you’re looking to ride something a bit different and don’t have a ton of cash to spend, you can’t go wrong with a Moto Morini like this 350 K2. 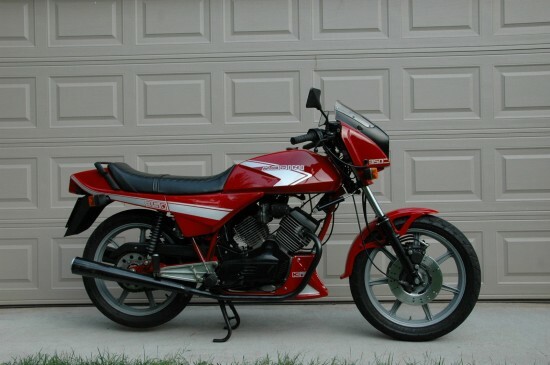 Throughout the 1970’s and 1980’s, Morini’s v-twins were available in both 350 and 500 flavors. 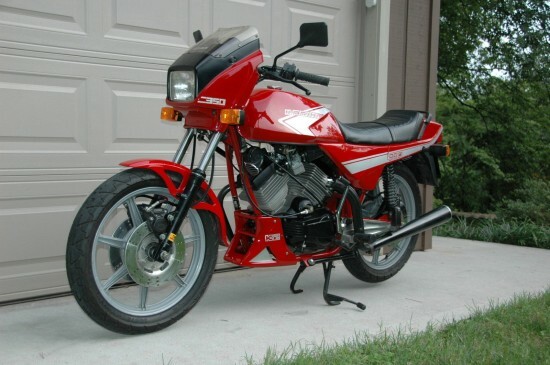 This example is clearly a child of the 80’s, but the styling is relatively restrained for the period and very tasteful. Powered by a little 72° v-twin that was more compact than the 90° engines from Ducati and Guzzi but was still very smooth, the 344cc engine generated a respectable 37hp and it put those horses through a six-speed gearbox and dry clutch combo. While pushrods were a slightly low-tech feature, the engine was otherwise very sophisticated: the camshaft was driven by a toothed rubber belt and Heron-style heads helped provide excellent fuel economy, as well as yet more interesting trivia for bike-night discussions. If you are looking at this, then you already know that these Moto Morinis are renowned for their razor-sharp handling and their nimble, fun-to-ride nature. This one is no exception. The V-twin is surprisingly powerful for a 350 and road tests had their top speed around 100 MPH. The 6-speed trans is a delight to use, snicking up or down with a left-hand shifter that was much improved over earlier versions. The dry clutch is easy to pull but it never slips. 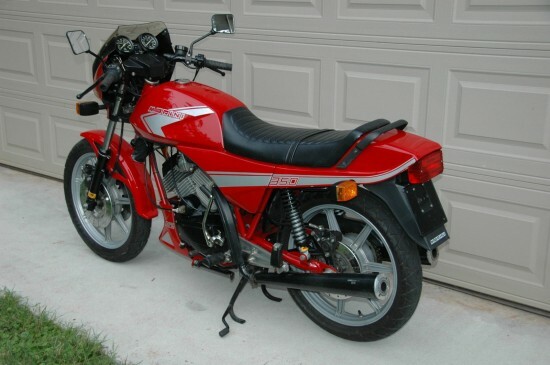 It starts easily with the kicker and it also has an electric starter that works-sometimes. These engines have a reputation for reliability and durability. They need very little maintenance with their electronic ignition and simple screw-type valve adjusters. 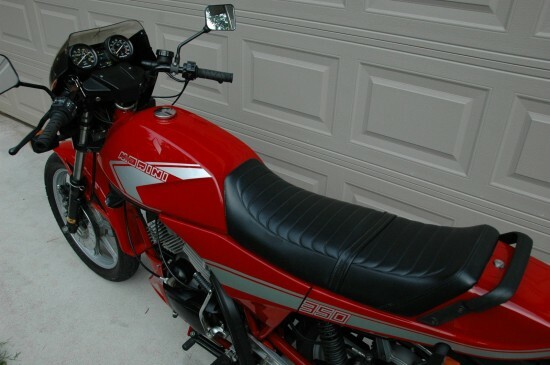 When I bought the bike four years ago I was amazed at its excellent original condition. When I got it home I changed the oil, cleaned the oil filter and adjusted the valves. 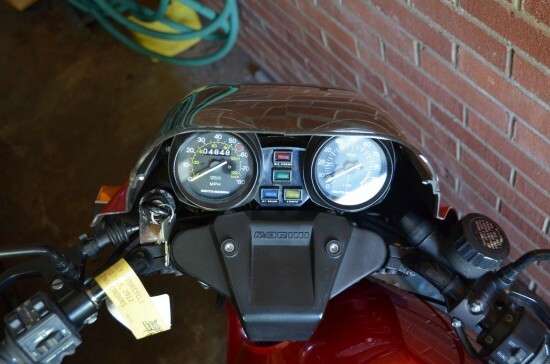 Since it had the original timing belt, I changed it for a new one that I got from North Leceister Motorcycles. They are the experts on these and they have a great stock of parts. They hold the K2 model in very high regard. I have since put about 750 miles on it. Some of those were from riding it in the Cycle World Rolling Concours at Indianapolis Motor Speedway in 2012. It was in the Modern Classic class along with some really over-the-top restorations, so I felt almost guilty about it winning 3rd place since all I had to do was wash it! The bike shows well, but there are the inevitable imperfections that one finds in a used, original bike. The windscreen is cracked. The flopping keys have worn the paint away at the ignition switch. There are a few nicks, the worst is shown in the pics. Bidding on this is active, although at just $1,500 or so, the reserve has not been met. Which is no surprise: aside from a couple minor scuffs, this thing is in amazing condition and is very rare. Morinis are rising in value, but are still very affordable. If you’re looking for a quirky, collectable Italian that you will definitely not see at your regular bike meetup, give this one a serious look.